Enter To Win Tickets to LITV Goes Country! Our Live in the Vineyard festival was so successful, we decided to do it again, country-style. 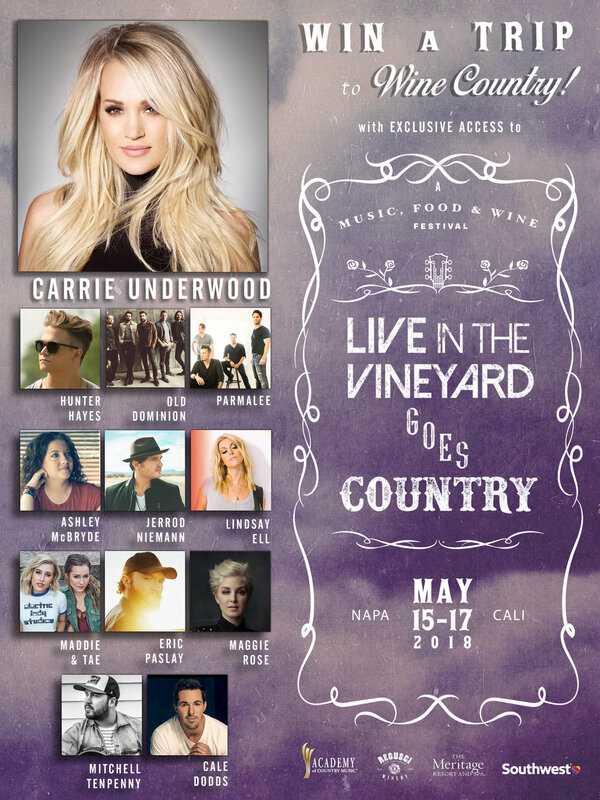 On May 15-17th, we’re hosting our first annual Live in the Vineyard Goes Country event in the ultimate destination for wine, food, and good times: Napa Valley! Get ready for three fun-filled days with tasty eats from renowned chefs, quality vino from nearby vineyards, and music strummed by the industry’s best artists! Headlining this fabulous event is the incredible Carrie Underwood, and you’ll also get to see Hunter Hayes, Maggie Rose, and Ashley McBryde perform, among others. We’re kicking this event off on Tuesday, May 15th, where Mitchell Tenpenny and Old Dominion will perform with the mesmerizing Napa Valley as their backdrop. On Wednesday, May 16th, we'll rise and shine with some tunes by Cash Campbell. As lunchtime rolls around, Maddie & Tae, Eric Paslay, Cale Dodds, and Jerrod Niemann will be playing their top hits, accompanied by libations and small bites for all guests. The main event is something you definitely won’t want to miss, as it features the wickedly talented Ashley McBryde, Parmalee, Hunter Hayes, and country superstar Carrie Underwood! To close out the festival, we’re hosting a send-off brunch. Here, you’ll see powerhouses Maggie Rose and Lindsay Ell sing their favorites, all while munching on appetizers, sipping bubbly, and taking in the breathtaking scenery of the seemingly endless vineyard that will be hosting us. Sound like a dream come true? We think so too! Enter for your chance to win simply by filling out this short questionnaire. But hurry - entries are only valid until April 26! And be sure to follow us on Facebook, Instagram and/or Twitter for more exciting news and updates! Contact us for more information or support.